Steps cool mint toothpaste. 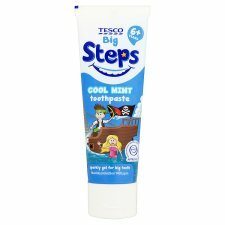 The Tesco Steps range of toothbrushes and toothpastes have been specially developed in conjunction with the International Dental Health Foundation to give the best possible care to your child's teeth as they develop. The gentle formulation with its cool mint flavour helps clean and protect your child's milk and permanent teeth. Sorbitol, Aqua, Hydrated Silica, PEG-32, Sodium Lauryl Sulfate, Cellulose Gum, Aroma, Sodium Fluoride, Sodium Saccharin, Trisodium Phosphate, Mica, Limonene, CI 42090, CI 77891. Contains Sodium Fluoride 0.32% w/w (1450ppm F).